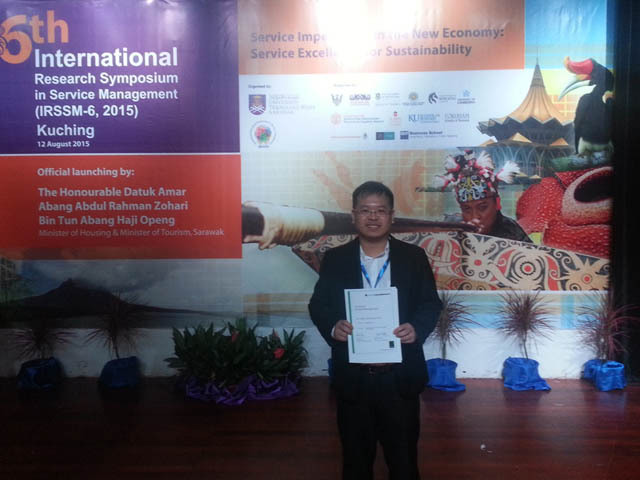 Faculty of Business and Finance (FBF) Senior Lecturer Garry Tan Wei Han was the proud recipient of the “2015 Highly Commended Award” by the Journal of Service Management, Emerald (UK). 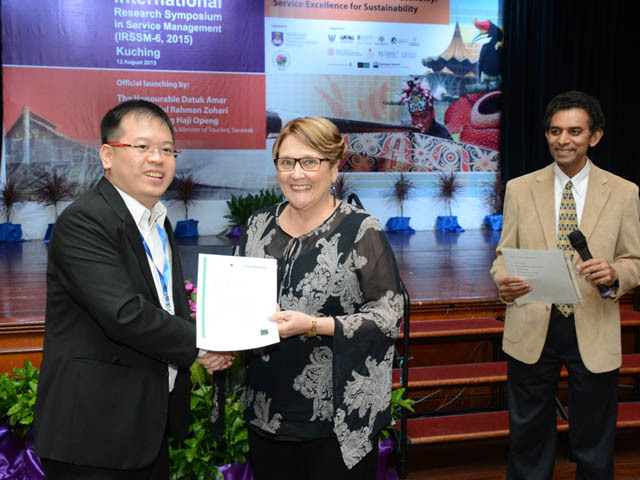 The prestigious award was presented to Tan by the Editor Prof Dr Jay Kandampully of Ohio State University, USA, and Prof Dr Alison Dean of University of Newcastle, Australia, during the 6th International Research Symposium in Service Management (IRSSM-6) held at Riverside Majestic Hotel, Kuching from 11 to 15 August 2015. Titled “Smartphone Credit Card: The Future of Mobile Payment System?”, Tan’s paper was co-authored with Prof Dr Ooi Keng Boon of UCSI University. The award-winning paper stood out amongst 115 papers submitted by academics from 18 economies including Malaysia, Cyprus, Taiwan, India, Germany, Indonesia, Sri Lanka, Australia, Sweden, Estonia, Mauritius, Thailand, Singapore, Germany, New Zealand, Bangladesh, the USA and Switzerland. “It’s an honour to have our research acknowledged. It’s our interest to study emerging technologies and how consumers react to them,” said Tan, who also attributed the success of the paper to the generous grant from the UTAR Research Publication Scheme. Journal of Service Management is currently indexed in Thomson Reuters (ISI) with 2.0 Impact Factor (Journal Citation Reports 2014).